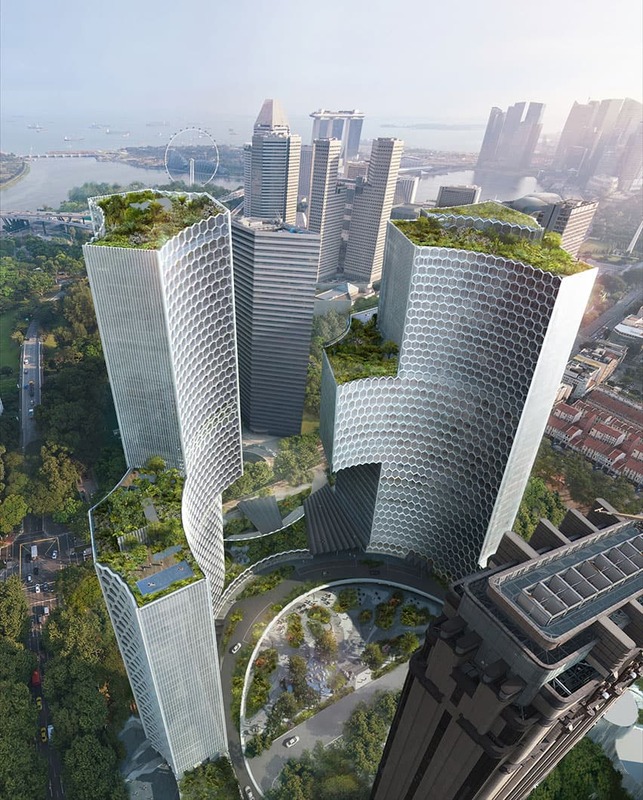 As part of a historic joint venture collaboration between Khazanah and Temasek supported by the Prime Ministers of Malaysia and Singapore, Ole Scheeren’s design for DUO articulates the symbiotic partnership, and actively engages the space of the surrounding city to form a new civic nucleus in Singapore’s modern metropolis. 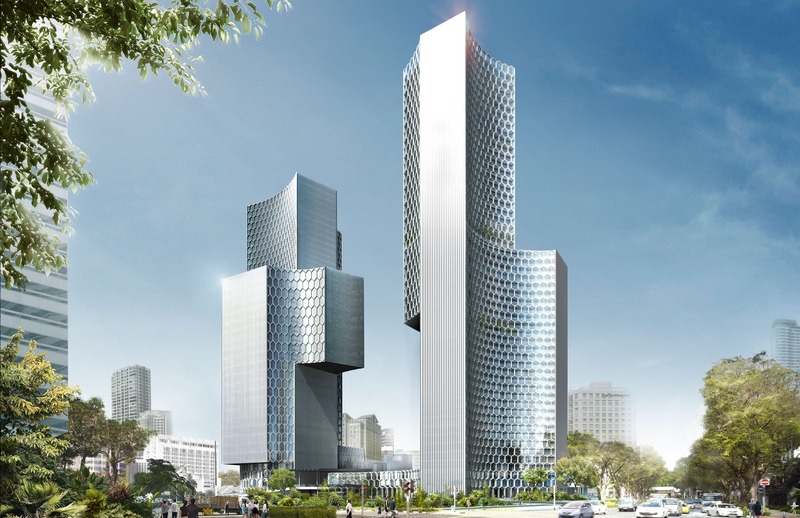 At an official ceremony hosted by M+S Pte Ltd, architect Ole Scheeren today presented the design for DUO, a new mixed-use, integrated development in Singapore. Featuring two sculpted towers rising from a tropical landscape, the scheme integrates offices, residences, a hotel, and retail space. Located along Ophir-Rochor and Beach Road, the project engages in an active dialogue with the diverse buildings and surrounding contemporary and historic urban fabric. The two towers are not conceived as autonomous objects, but defined by the spaces they create around them. The design for DUO subtracts circular carvings from the building volumes in a series of concave movements that generate and articulate urban spaces and symbiotically inscribe the two buildings into their context. Slender facades soar skywards along the adjoining roads, while a net-like hexagonal pattern of sunshades forms a natural texture that reinforces the dynamic concave shapes. The duo of tower volumes is further sculpted to feature a series of cantilevers and setbacks that evoke the kinetic movement of a dancing couple or two sparring tai chi masters. The buildings dematerialize as they reach the ground to provide a porous and permeable landscape traversing the site. Leisure zones and gardens act as a connector between multiple transport hubs and establish a flow of tropical green and lively commercial activity, accessible to the public 24 hours a day. A plaza, carved into the center of the towers and strategically incorporating the neighboring building as part of its perimeter, forms a new public nexus between the historic district of Kampong Glam and the extension of the city’s commercial corridor. Commissioned in March 2011 and due to commence construction early 2013, DUO further expands the portfolio of Ole Scheeren, who was the leading architect behind the CCTV headquarters in Beijing, with innovative projects of civic scale and public ambition. He is also engaged in cultural projects of a more intimate scale including a studio/gallery building for a Beijing-based artist, and Archipelago Cinema, a floating outdoor auditorium that premiered at the Film on the Rocks Yao Noi Festival in Thailand and, more recently, was featured in the 13th International Architecture Exhibition at the Venice Biennale.